*Alison Larkin in particular is interested and available for interviews. Please contact Tim Dorgan (tdorgan@gmail.com) to coordinate. 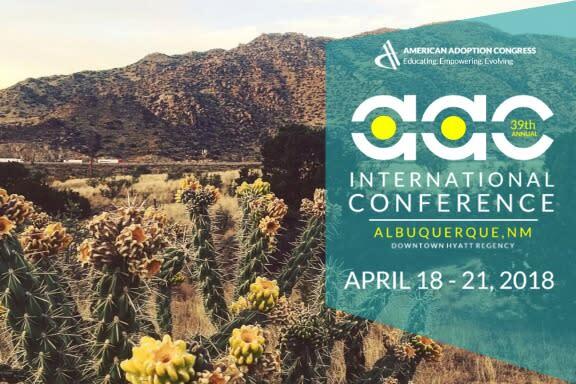 ALBUQUERQUE, N.M. – April 10, 2018 – The American Adoption Congress will hold its 39th annual conference in Albuquerque, New Mexico from April 18-21, 2018. The American Adoption Congress (AAC) is an International organization devoted to family connections by providing the needed education for all members of the adoption constellation. Its annual conference is a showcase for leading practitioners in all aspects the adoption world to provide education, assistance and support to all those touched by adoption. The Annual Conference will feature a compelling array of keynote speakers, 30+ workshops and special events that include a New-Mexico-first screening of the film “Thank You for Coming” plus an appearance by the internationally renowned comedienne Alison Larkin presenting her one-woman blockbuster, Alison Larkin Live! The Conference will be held at the Hyatt Regency Albuquerque. Limited reduced-rate rooms are still available. For more information on the AAC Annual Conference, including registration details, please go to www.americanadoptioncongress.org. The American Adoption Congress is comprised of individuals, families and organizations committed to adoption reform. We represent those whose lives are touched by adoption or other loss of family continuity. We promote honesty, openness and respect for family connections in adoption, foster care and assisted reproduction. We provide education for our members and professional communities about the lifelong process of adoption. We advocate legislation that will grant every individual access to information about his or her family and heritage. For more information, contact us at www.americanadoptioncongress.org.